This continues to be a strange season in my running life. Yesterday I came home and wasn’t feeling well. I had a bit of a sick headache. My thought was to perhaps skip my 5 mile run for the day and just walk a few miles. By the time I got home I felt better thanks to my Lovely Wife suggesting I drink some chocolate milk. I guess it was low blood sugar. Anyway, I decided to go out for my run. It went really well. In fact it went much better then Tuesday’s run. I did have my ACV before I went out as usual, but the run was stranger then my runs lately. I ran easy. I decided to not push myself. I told myself to just take it easy and get a slow 5 miles in. As I ran, I noticed my pace improving. I wasn’t pushing myself. In fact I was trying not to push. The more I relaxed, the faster my pace got. 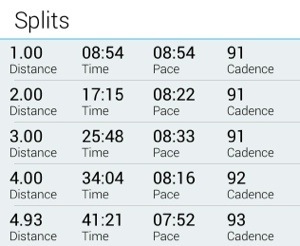 There were actually a few times where I got below 7:00 pace – and I didn’t feel like I was running very hard at all. In the usual places I got a bit tired and did have a phone call during my run, but I felt strong and well for the whole run. My last mile (almost a full mile – I don’t care much anymore about the last .05 of a mile) I ran at a pace below 8:00. I was, however, pushing more at that point since I knew it was going to be a good run for me. It was a good run. 8:23 pace overall. I really don’t know what I am finally doing right. I feel good while running. My hip is doing well. My pace is getting better and my VO2 Max seems to be improving greatly. I have had thoughts of increasing my mileage, but I am good with 5 miles a day and 8 – 12 on my long day. Rhythm is important and I feel like I am developing one. In fact, this was pretty much my whole training for my marathon. 5 miles a day during the week and 10 – 20 on the weekend. So things are moving in a positive direction… Thankfully. My weight is also down. I was up above 190 for a bit, but am now at 187. Hopefully that will continue to go down. My half marathon is in just over 3 weeks. I plan on getting in an 11 or 12 mile run this weekend and 13 the next. This could be a very interesting race for me. I’m beginning to actually look forward to it. This entry was posted in Half marathon, Half Marathon Training, Marathon training and tagged half marathon, Marathon Training, running, training, Weight loss. Bookmark the permalink. I have to agree with the other commenters. Some of my most exhilarating runs have been when I was forcing myself out the door (kicking and screaming sometimes). I think it has to do with expectations. When our expectations about the run (and about anything) are low, we give ourselves a lot of room to appreciate the little things. True and wise. Expectations, as you mention, are key to a lot of things and how they relate to what we do and how we do them. Just expecting a good run, might make you start off harder and try more aggressively rather than beginning with a slower warmup. Ultimately, a slow and easy beginning is aways best for running I think. Thanks for the comment and the follow! Definitely. And of course! I look forward to reading more. Runs like that are the best, when you start just kind of “blah” and then you are feeling great and running fast. My favorite! I totally agree. It is like a gift. Nice to hear that you’re feeling strong again! Your training is so consistent – I’m sure you’ll do great at the half marathon!! That makes total sense!!! It is amazing hoe psychological running is!! !